All participants could vote for the best poster. The winner of the poster competition was announced at the closure of the conference. 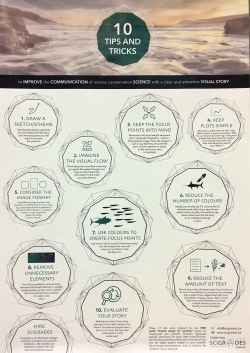 Thirty posters - with best practices on marine science communication - were exhibited during lunch and coffee breaks. The social media team posted Facebook Live elevator pitches by the poster presenters on the CommOCEAN Facebook page (www.facebook.com/commocean). 10. The power of citizen and science to monitor cetacean occurrence and spatial distribution in Macaronesia offshore waters.